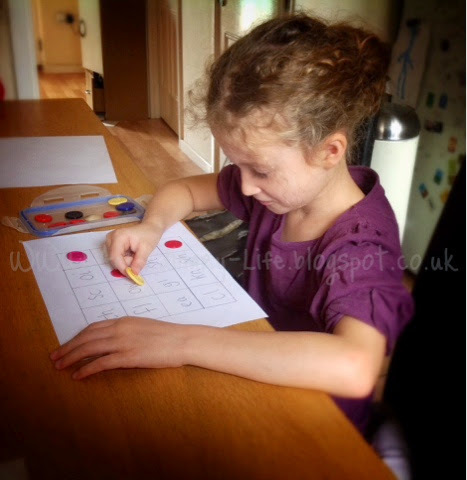 An Ordinary Life : Spelling Bingo: Learning to spell through play! Spelling Bingo: Learning to spell through play! I filled them with some common letter sounds to help with spelling: fl, ou, oi, ph etc. I filled the grid so there was 20 in total. Find a box full of buttons, each player will need 16 buttons for this game. Now click here for my list of words to read out for the Spelling Bingo games. This list was made to work with the boards I have made into printables. You could either read the words out or, alternatively, cut them out and draw them out of a hat or a bucket if you want to make it more like Bingo. first one to fill up the board and shouts BINGO wins. For the Easy bingo I made the rule that it was always the beginning letter we look out for. For the Medium and Hard level I said the sound could be from the beginning, front or the end of the word. I read each word out and put the word into a sentence so the children could be confident of which spelling due to homophones. If they had the letter sound they got to cover the square with a button. If they missed a letter sound on their board I left it for next time and said nothing, if they put a button on the wrong letter sound, I informed them it was incorrect and asked kindly, for them to remove the button. I gave them 30 seconds or so to look at the board each time a new word was called out. With my youngest, aged 4, I helped her a little more by repeating the phonic and, when she got stressed, helped her to find the letter that went with the sound. Soon she remember which sound went with which letter and needed less and less help. I hope you have as much fun as we did playing it!